Baltimore police responding to a call for shots fired around 11:35 p.m., found the body of 28-year-old Antonio Wilson, slumped over inside a 2001 Chevrolet van. The drivers side door and window had multiple bullet holes with an unstated amount of shots hitting Wilson. Wilson was transported to Maryland Shock Trauma Center where he was pronounced dead 30 minutes later. The incident occurred on N. Calverton St near the intersection of Wheeler Ave. This reporter observed the victims van was still running with the headlights on after crashing into the rear of a parked white pickup truck and smashing into a utility pole. Witnesses tell the Baltimore Spectator a lone gunman on foot ran up to the van as it stood still at a stop sign and opened fire on the driver, before running off in an unknown direction. 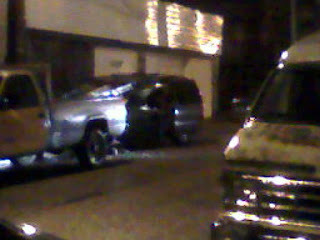 The driver of the van loss control while attempting to flee his attacker. Unconfirmed reports say a female passenger may have also been in the vehicle and was unhurt. Although Wilson had several trials on drug related charges pending, police do not have any suspects or a motive at this time. The shooting happened on the same block as a blue light CitiWatch surveillance camera. Police have not said whether or not the camera provided usable footage. 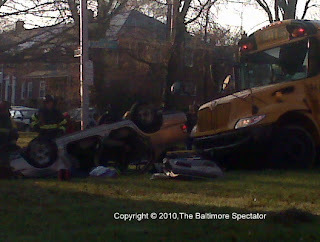 Six medics responded to a collision between a car and a school bus on Loch Raven Blvd. near Lochwood Street. The crash was reported at 7:45am. Authorities say a woman driving a car carrying three children crashed with a school bus carrying special needs children to Winston Elementary. The school bus driver was taken to nearby Good Samaritan Hospital, while two 14-year-old boys, a 12-year-old boy and a 13-year-old girl, all passengers of the school bus were taken to Johns Hopkins Bayview. Two boys, ages 7 and 14, riding in the struck vehicle were also transported to Bayview. The Baltimore Spectator's own, photographer Dennis Pugh was on scene shortly after it the accident happened and was able to capture these dramatic photos of the scene. As horrific as it looks, we're told none of the injuries were serious.